The Onondaga Trail is one of the branch trails of the Finger Lakes Trail System. This trail system has well over 900 miles of hiking trails in New York state. The Onondaga Trail currently, as of April 2013, is 39.9 miles long. The North Country National Scenic Trail runs concurrent with the entire Onondaga Trail, which makes us wonder why there is a need to still call this the Onondaga Trail? Why not just call it the North Country National Scenic Trail, instead of confusing hikers with multiple names on the trail. The trail carries the North Country Trail from the Finger Lakes Trail in Cuyler Hill State Forest at "Three Trails Junction" to the Link Trail in Tioughnioga WMA. From there the Link Trail brings the NCT through Cazenovia to Canastota and the Old Erie Canal Trail. We believe the time has come to just call it the North Country Trail, instead of Onondaga Trail, Link Trail, etc. The Onondaga Trail is maintained by the Onondaga Chapter of the Adirondack Mountain Club. This hiking club has added many miles to this trail over the last few years. The Onondaga Trail is a great long weekend backpacking trip for those looking for challenging adventure. If your thinking about doing a long backpacking trip, we would recommend a 3-day, 2-night backpacking trip on the Onondaga Trail to gain backpacking experience prior to attempting a longer trip. The Onondaga Trail goes through state, county and private lands. The state and county lands include Cuyler Hill State Forest, Maxon Creek State Forest, Morgan Hill State Forest, Highland Forest County Park, Deruyter State Forest and Tioughnioga Wildlife Management Area. The trail also crosses private property thanks to the generosity of the landowners. Please respect private property and stay on the trail. Camp only in state lands. The Onondaga Trail offers a long backpacking loop hike utilizing the Link Trail and Finger Lakes Trail. This backpacking loop hike travels into four counties in central New York. 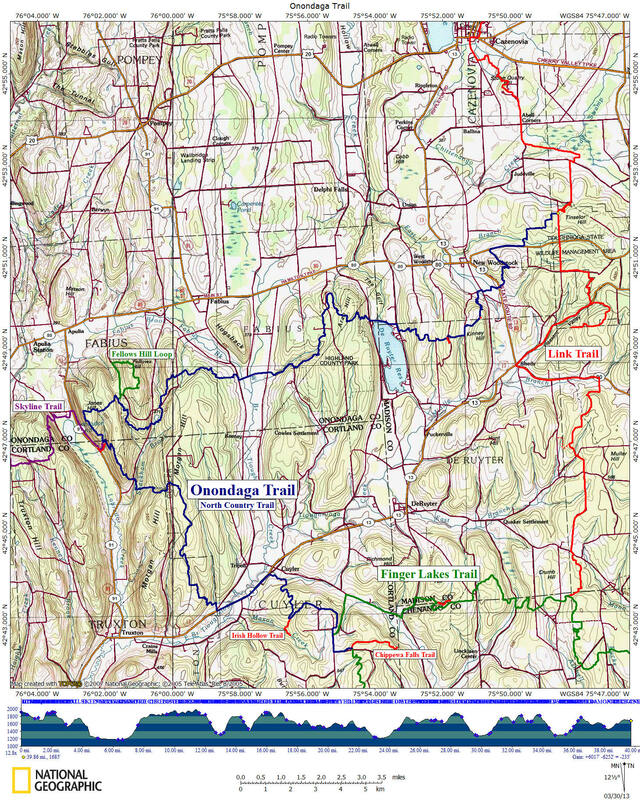 Called the Onondaga Finger Link Loop (OFLL), this loop hike is nearly 100 miles. Look below for a complete map of the Onondaga Trail as well as a detailed description of the complete 39.9 mile Onondaga Trail. Use the links above and below for a closer look at the Onondaga Trail. Stoney Brook Rd. Parking. Follow white blazed Finger Lakes Trail / North Country Trail north. Three Trails Junction. Official start of the blue blazed Onondaga Trail on the left. The North Country Trail now follows the Onondaga Trail. Turn left and follow blue blazes. The orange blazed trail that goes straight at this junction is the Chippewa Falls Trail. Reach Stoney Brook Road and turn right following road. Views. Reach Cuyler Hill Road. Turn right and follow road. Junction of Midlum Rd. Veer straight and follow Midlum Road. Soon after where road turns left, trail leaves road on right following farm road, then another right along fence. Soon pass a very old cemetery. You are hiking on PRIVATE PROPERTY. Views from a pipeline right of way on your right. Entering section of trail where landowner requests that hikers are QUIET during big game hunting season (OCT 1 - DEC 31). Quiet until border of Maxon Hill State Forest. Reach Midlum Hill Spur Rd. Views. Trail turns right and follows old road downhill. Entering Maxon Creek State Forest. Orange Blazed Irish Hollow Trail on your left (dead end trail). Begin to ascend. Begin the sometimes steep descent toward NY 13. Soon leave state forest & enter PRIVATE PROPERTY. This stretch of the trail on private property is CLOSED for HUNTING from Oct 25 - Dec 25. Reach NY 13. Parking. Turn left and follow busy NY 13. Cross Tioughnioga River and reach a DEC parking area on left. PARKING. Turn right on West Keeney Road then a quick left onto a farm lane. This stretch of trail on private property is CLOSED for HUNTING from Nov 15 - Dec 25. Entering Morgan Hill State Forest. Trail register and then cross seasonal dirt Chickadee Hollow Road (parking along shoulder of dirt road). Highest point along Onondaga Trail. Off to your right is the old Morgan Hill Fire Tower & camping area. No water available here. Cross Morgan Hill Road. Parking. Hemlock Lean-To is 150 feet off trail to your right. Cross Shackham Brook on footbridge. Cross Shackham Road. Parking. Soon trail register. Entering Labrador Hollow Unique Area. No fires allowed. Stairs and then reach the top of Tinker Falls. 15.1 1529 feet Junction of the orange blazed Skyline Trail. Blue blazed Onondaga Trail / North Country Trail turns right. Skyline Trail goes straight steeply ascending to NY 91 parking area in 0.3 miles. Hang Glider view. Soon enter PRIVATE PROPERTY. Re-entering Morgan Hill State Forest. Spruce Pond on your left. North Country Trail Kiosk. Side trail on left leads to a small parking area in 150 feet. This is also the start of the Fellows Hill Loop. Cross Shackham Rd. Parking. Soon pass Shackham Pond. Cross seasonal dirt Onondaga One Road. Parking. Leave Morgan Hill State Forest. Now on PRIVATE PROPERTY. View of Fabius, NY. Soon more views. Right on West Keeney Rd. Cross Vincent Corners Rd. Stay straight. Road now Cowles Settlement Rd. After sharp right turn, trail leaves road on left. Enter Highland Forest County Park. Parking. Skyline Lodge. Views, bathrooms, water, vending machines. Parking. Leaving Highland Forest County Park. Entering PRIVATE PROPERTY. Reach West Lake Road. Turn right then left on Dam Road. Soon a small parking area. Turn right on East Lake Road. Turn left into small parking area. Trail leaves the end of parking area through grass, then turns right onto well worn path. PRIVATE PROPERTY. Leave Deruyter State Forest. Reach Fairbanks Road. Turn left & follow road. Trail turns right off road. Trail skirts Armstrong Pond. Enter PRIVATE PROPERTY. Shoulder parking. Reach Webber Road. Parking. Turn right and follow road. Turn right on Parker Rd aka School Street. Turn left after barn at trailhead sign. Follow farm lane. PRIVATE PROPERTY. Cross NY 13. NOTICE: The trail from here to Smith Road is CLOSED for HUNTING from May 1-31 and October 1 - December 25. No parking available. Reach Smith Rd. Turn left and follow road. Parking. Turn right on Damon Road. Turn left off road and follow edge of field. PRIVATE PROPERTY. Ford Limestone Creek. Soon enter Tioughnioga Wildlife Management Area. Reach junction of the yellow blazed Link Trail. End of Onondaga Trail.